Register now for the complimentary webcast from 2 to 3:30 pm EST on Nov. 17, "The Post-Election Outlook for Design and Construction," featuring three chief economists: Ken Simonson, AGC of America; Kermit Baker, American Institute of Architects; and Alex Carrick, ConstructConnect. Voters approved several long-term measures to increase local sales taxes for public construction and operations on Tuesday. Los Angeles and San Diego voters each approved measures to raise the sales tax rate ½-cent in 2017 to generate $120 billion and $18 billion, respectively, over 40 years. In Los Angeles, construction would begin on $2.5 billion each in 2018 and 2019 on projects including local street improvements. Spending in San Diego would include transit and road projects. Atlanta-area voters approved varying amounts of sales tax increases for expanding and improving mass transit and other transportation. Numerous local bond issues authorizing $500 million or more also passed. In California, voters approved $3.5 billion for the San Francisco Bay Area Rapid Transit Authority; $3.3 billion for the Los Angeles Community College District (CCD); a $1.2 billion city homeless bond plan in Los Angeles; $750 million each for the Chino Valley and San Juan Unified School Districts (USDs); $748 million for the San Jose–Evergreen CCD and $510 million for the East Side Union High School District around San Jose; $744 million for the San Francisco USD; $600 million to improve infrastructure and build affordable housing in Oakland; $580 million to build affordable housing in surrounding Alameda County; $578 million for renovation and expansion of College of the Desert in Riverside County; and $503 for Kern CCD. In Texas, voters approved $720 million for transportation and mobility projects in Austin; $669 million for the El Paso Independent School District; and $500 million to help build a new stadium for the Texas Rangers baseball club in Arlington. Columbus, Ohio, received approval on $950 million, largely for utilities improvement, street and highway projects. In Denver, School District (SD) 1 received $572 million of bond authorization, but Jefferson Co. SD R-1, Colo., failed to get approval for $535 million in bonds. 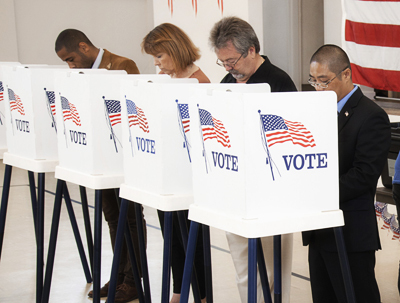 For more information on local ballot issues, contact AGC's Brian Lenihan, lenihanb@agc.org. Voters in four states approved 11 statewide bond issues on Tuesday that will fund building, transportation and environmental construction. California approved $9 billion for K-12 schools and community colleges; New Mexico passed $142 million in bonds for higher education, special, and tribal schools; and Rhode Island passed $45 million in bonds for higher education. Rhode Island also passed $182 million in bonds for veterans housing, affordable housing, port infrastructure, and environmental projects. New Mexico passed $15 million for senior facility bonds and $18 million in public safety infrastructure improvements. North Carolina passed $2 billion in public improvement bonds, mostly schools and higher education. In contrast, voters in Massachusetts rejected a new slots-only casino facility license, and New Jersey rejected two new casinos. Maine approved $100 million in new transportation bonds, while Illinois, Louisiana and New Jersey voters approved measures to dedicate funds for transportation. For more information on state ballot issues, contact AGC's Scott Berry, berrys@agc.org. There were 221,000 construction industryjob openings, seasonally adjusted, at the end of September, the Bureau of Labor Statistics (BLS) reported on Tuesday in its monthly Job Openings and Labor Turnover Survey (JOLTS). Openings amounted to 3.2% of combined employment plus openings. Both figures were the highest for September since the series began in 2000. In contrast, the seasonally adjusted hiring rate (4.6% of monthly employment) was the lowest in series history, and the number of hires (310,000) was the second-lowest September total. The number and rate of layoffs and discharges in September, seasonally adjusted, are near the lowest levels in the 16-year history of the JOLTS data. One possible interpretation of these facts is that contractors are holding onto workers but have been unable to find the ones they need, hence have a low hiring rate and a high rate of openings at the end of the month. On Wednesday, BLS issued the less timely, but more complete, report on Business Employment Dynamics for the first quarter of 2016 (2016Q1). That report showed little change in gross job gains at expanding and opening construction establishments from 2015Q1 (666,000, seasonally adjusted) to 2016Q1 (661,000). Gross job losses at shrinking and closing establishments declined slightly from 623,000 to 607,000. Thus, the net employment change was virtually the same (43,000 in 2015Q1, 54,000 in 2016Q1). Yet construction spending increased more than 10% from 2015Q1 to 2016Q1, according to the Census Bureau, implying that firms would have added employees if they had been able to find them. Investment research firm Thompson Research Group issued its October 2016 Building Products Survey today. "Steel prices took a step down starting in August, taking a breather from the sharp spike in early 2016. TRG industry contacts reported pricing peaked in August and have stabilized since early September. [All wallboard, insulation and ceiling product] respondents reported 'flat' sequential pricing in October....A few contacts pointed out the market would accept a portion but not all of the announced ~20% [price increase for wallboard in January 2017]. 57% of survey respondents expect at least a portion of the increase to be accepted. [For roofing,] 75% of respondents reported 'flat' sequential pricing trend....Owens Corning in mid-October announced a 6% insulation price increase for January 2017." The Dodge Momentum Index grew 4.1% in October from its revised September reading, Dodge Data & Analytics reported on Monday. The index is "a monthly measure of the first (or initial) report for nonresidential building projects in planning, which have been shown to lead construction spending for nonresidential buildings by a full year. October's gain nearly reversed the loss in September....The commercial component of the Momentum Index rose 6.1% in October, and is 20% above last year.... The institutional component of the Momentum Index increased 1.4% in the month, and is now 10% higher than one year ago." The Data DIGest is a weekly summary of economic news; items most relevant to construction are in italics. All rights reserved. Sign up at www.agc.org/datadigest.